A beautiful technical manual with all the information necessary to start and run your own tofu plant or soy dairy on any of seven scales and budgets from a community shop up to a pressure cooker plant or a modern factory. Based on over seven years of research with master craftsmen and modern producers in the U.S. and around the world, it is a guidebook to a new vocation and a new way of life. This book as been used to start hundreds of tofu plants and soy dairies in America, Europe, Oceania, and Asia , since 1977. 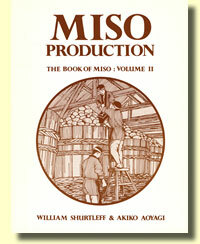 A craft and technical manual explaining how to start and run your own miso shop or factory on any of four scales and budgets. Describing traditional, semitraditional, and modern production methods as they are now actually practiced in Japan , this work is based on three years of research and field work with Japan 's best known and most esteemed miso producers. The many illustrations highlight the detailed descriptions of equipment, plant layout, and processes. This revised second edition is updated and expanded with a longer introduction plus new appendixes and a new bibliography. This attractive craft and technical manual describes how to start and run your own tempeh shop on any of four scales and budgets in North America, from a small community or kitchen shop up to a steam cooker plant or modern factory, and on either of two scales in tropical Third World countries. Based on three years of research, including extensive field studies with top tempeh producers in the U.S. and Indonesia , this book will long remain the definitive work in this vital new field of soy protein food production. It has already been used to start many successful tempeh shops and plants in North America . Here is the book that will ensure tempeh a lasting place in our daily diet. "An indispensable operating manual for soyfoods entrepreneurs. The illustrations alone make the book a valuable reference tool. a sustained inspiration. The only book of its kind in English." 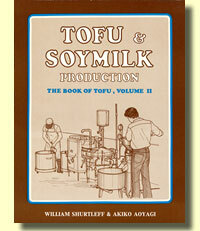 "The most up-to-date, comprehensive publication about the manufacture of tofu and soymilk available today. an excellent source of worldwide information on soyfood production, business operations, consulting services, equipment, and research organizations. an excellent reference for the beginner." "Superb technical drawings lend clarity and dimension to this excellent how-to-book." "Excellent illustrations. A useful guide for food technologists and others interested in fermented soybean products." "A masterful and definitive work, replete with illustrations that elucidate the intricacies of commercial tempeh production. The authors assist the reader in translating homegrown tempeh enthusiasm into actual commercial production success and present invaluable process descriptions from many U.S. tempeh shops." 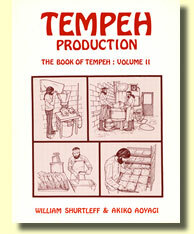 "An in-depth and comprehensive reference book for manufacturing tempeh. Excellent illustrations and an easy-to-read text make this book a must for tempeh business operators and food technologists."